I was using a little bluetooth speaker to listen to tunes while I commute, a little buckshot by Outdoor tech. Unfortunately I lost it at a bar last summer and have been using earbuds since, which I don't prefer. A google or amazon search turns up a million different speakers and it's hard to view online. Anyone on RBR using a speaker on their bike? What do you use? What do you like about it? I'm in PDX so it has to be water resistant because I frequently commute in the rain. Handlebar mount was fine, though the sound quality of the Buckshot was similar to the original iphone earbuds (terrible) and the bluetooth range wasn't far enough that I could put my phone in my jersey pocket and have the speaker mounted on the handlebars (they didn't test this when they designed the speaker?). A water-bottle mounted speaker would be cool. In the past I used a Cy-Fi, but it is no longer made and it was kind of oddly shaped. 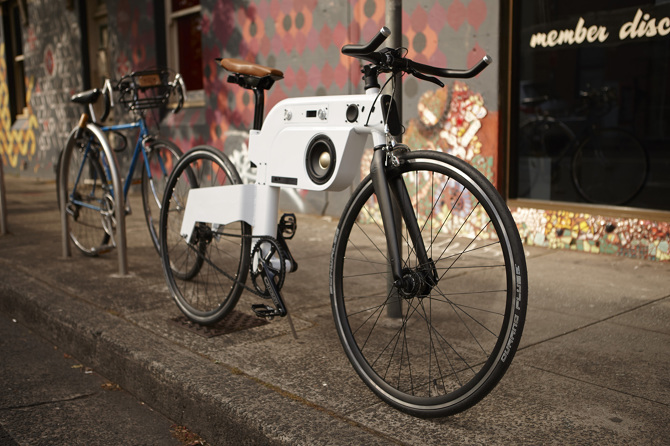 I actually was in the same boat looking at amazon for a compact one, easy to mount on a bike. BUT there are so many choices there, with so many fake reviews, that it is hard to find out which is really a good one. I am keeping my eye on this thread. I use the Outdoor Tech Buckshot speaker and I like it quite a bit. It's certainly made my commutes much more enjoyable. FWIW I had no issues with the blue tooth range, but I find that if my body is in the direct path from my phone to the speaker I can make it glitch a little bit. I experience no issues when the phone is in my jersey pocket or pannier pack while riding, but only have issues when stopped and I'm leaning the bike over while at red lights. In fact it is still playing when I walk up to 10 yards away from the bike. I would have no qualms getting another Buckshot if I were to lose mine or if something were to happen to it. Cycle Sound was my favorite but it wasn't bluetooth. JBL Charge lasted 2 years fit in the water bottle holder. Did a great job, but battery crapped out on me. JBL Charge 2 is good loud and is holding up good so far. This also goes in the water bottle holder. I never used them when it's raining or damp out for fear of destroying them. JBL Flip 2 isn't bad it's mainly my work speaker, but if you use a small bungee cord it will also work in you water bottle holder. The JBL charge is loud enough to put in a saddle bag but the flip isn't. I have seen a lot of cheaper ones but I'm more afraid of quality of unit and loudness of sound. I've tried to pretend a few water resistant offerings from various brands were waterproof. My first purchase of waterproof, which it sounds like you need, was my last: UE (Ultimate Ears) Roll. Not the biggest sound but I certainly don't want that in traffic. It's perfect for me and reasonable at $100. I also use the Buckshot on the bars. It's rugged, has long battery life, and good integration with my phone, so I can take calls through it. Mine sounds OK for the size, but certainly not "great". I use 256k mp3s only, most ripped direct from CDs. The quality of the source DOES make a difference still, even on the small players. On the other hand, the Super M sounds a LOT better, and is also rated waterproof. I don't use this on my bike, the Buckshot is more convenient. but it should easily fit in a water bottle cage. It really rocks though, for the size.